Hike through the dry forest with the chance to see wild animals. Beautiful and stunning views of Arusha National Park and Kilimanjaro. Hike through the mountain rainforest, buffalos often visible. At midday, ascent to Little Mt. Meru (3820m). Long summit hike with fantastic views and light climbing passages. Comfortable descent, good opportunity to view and observe the wildlife. Upon arrival at Kilimanjaro Airport in Tanzania, you will be greeted by your driver and taken to your hotel, the Green Hills of Africa in Usa River. The rest of the day will be yours to do as you please. You may choose to relax after your arrival at the hotel after your arrival or have a stroll through Arusha (Taxi / Transfer necessary). In the evening, you will have a preliminary talk in preparation for your trek the following days. In the morning, you will be collected from your hotel and after a 5-minute drive, you will arrive at the Arusha National Park Gate. At the national park gate, your guide will complete the obligatory entry forms and whilst he does so, you can peruse the information boards of the national park. Once the formalities have been completed and the hiking team consisting of porters from the surrounding villages is formed, you will then be driven a little further to Momella Gate. An armed park ranger will accompany you while you start your hike and get a first glimpse of the wonderful giraffes and buffalos. Once you have left the buffalo herds and giraffes behind, you will enter the acacia forest in which you will follow the Southern Route. After a steady 2-hour climb, you will reach Maio Falls and some picturesque meadows that are a perfect place for a picnic. After a rest, you will again be on your way and soon reach the well-known ‘Arched Fig Tree’. Here your park ranger will tell you about the formation of this tree and how it gained its shape forming an arch over the path. 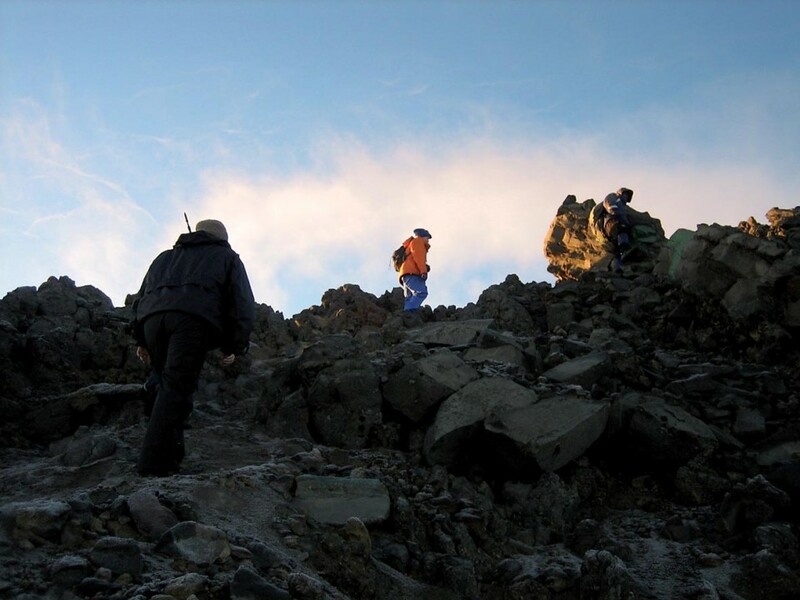 After another 1½ – 2 hours, you will reach the Miriakamba Hut. 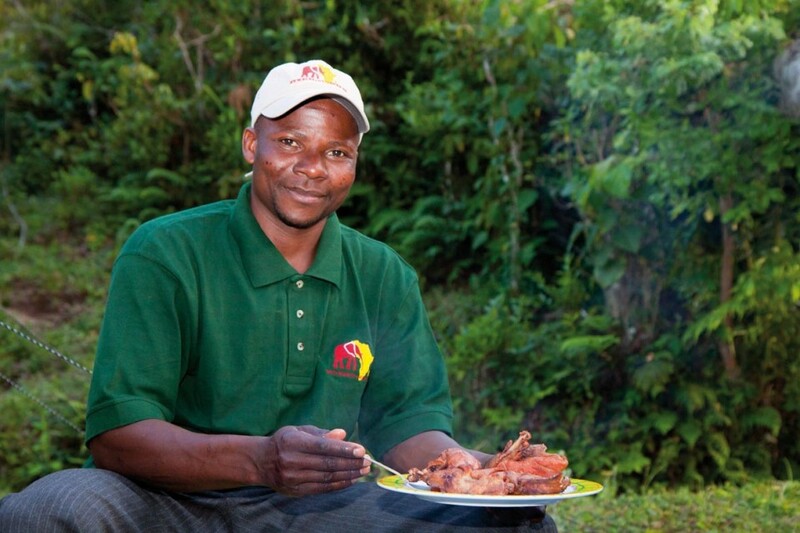 Evening meal and overnight stay at the Miriakamba Hut. In the morning, you will leave the Miriakamba Hut behind and follow a steep track with wooden steps upwards. Due to the gain in height, it will be noticeably cooler than the previous day and due to this, the hike will seem to get easier. The clouds also often hang in the rainforest and dip the lush vegetation in a moody atmosphere. After approximately 2 hours, you will reach the vantage point ‘Mgongo wa Tembo’ (Elephant back) at an elevation of 3200m, where you will enjoy a well-earned break. After another hike in which the vegetation changes from rainforest into an airy bush land, you will reach Saddle Hut (3550m) at midday for a relaxing lunch break. During the afternoon, you have the option of a side trip to Little Meru (3820m) which takes approx. 1 – 1 ½ hours and from where you can have wonderful views of Arusha National Park and of the Kilimanjaro (approx. 80 km away). Back at the hut, a warm dinner is waiting for you before you will have the final preliminary talk in preparation for the following day’s climb to the summit. After an early start with tea and biscuits, you will leave for the summit at 02:00 hrs. By torchlight, you will follow the trail through bush land to the so-called Rhino Point (3821m) in which the path turns into a little more challenging trek with occasional light climbs. You will follow the north ridge to the summit on which you walk on ground alternating between lava ash and rock. After approx. 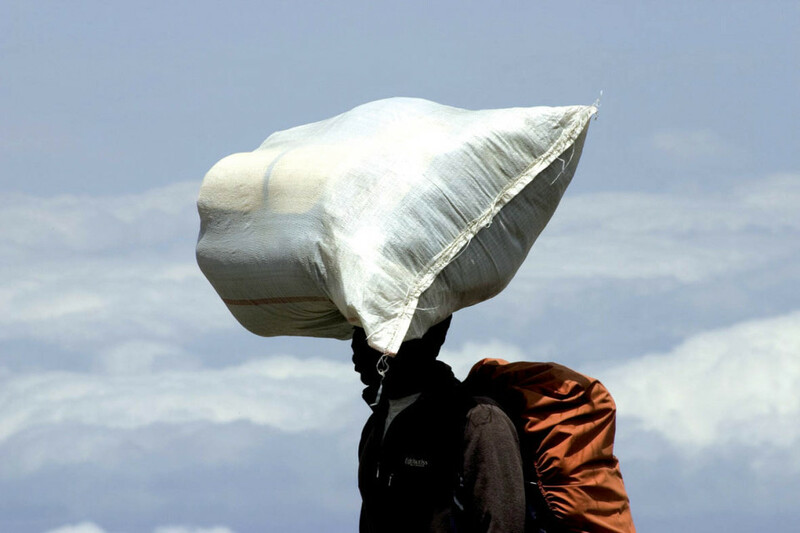 4 – 5 hours, you will have the summit and the Tanzanian flag in your sights. 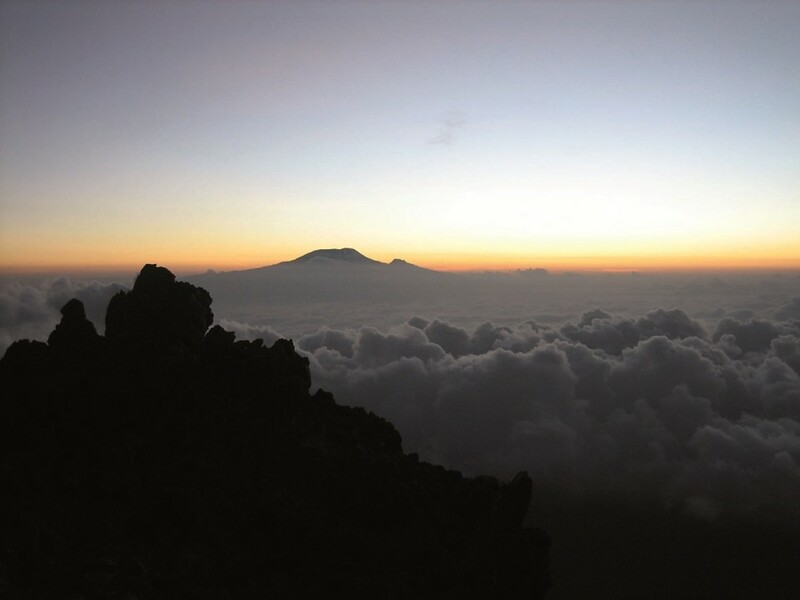 From the summit, you will be able to enjoy the sun rising above Kilimanjaro and the fantastic view of Mount Meru's crater with its steep sides and the “Ash Cone” in the middle. The descent follows the same route back to Saddle Hut (3550m) where you will take a well-deserved long break and recuperate with hot soup and tea. Once refreshed, you will continue with the descent. During the early afternoon, you will reach Miriakamba Hut (2500m) - tired but happy. At this hut, you can relax and think about the last stage that you have completed. Evening meal and overnight stay at Miriakamba Hut (2500m). After breakfast, you will follow a 2 - 3 hour trek over the so-called ‘Northern Route’ back to Momella Gate. The descent is shorter than the ascent but there is still the chance to see elephants, buffalos, giraffes as well as the black and white columbus monkeys. At the gate, you will say farewell to your hiking crew and your driver will take you back to the Green Hills of Africa Hotel. Once there, you can relax after your mountain tour and celebrate your achievement. After breakfast, you can continue with your travel plans. Note: The summit stage contains a few simple but unsecured climbing passages. A good head for heights and sure footedness are absolutely necessary. In adverse weather conditions (heavy rain, icy rocks and paths or thick fog) the park ranger can call off the climb to the summit. We do not advice climbs in the rain season (April and May). - Group sizes vary however there is a minimum of 2 and a maximum of 8 travellers per group. 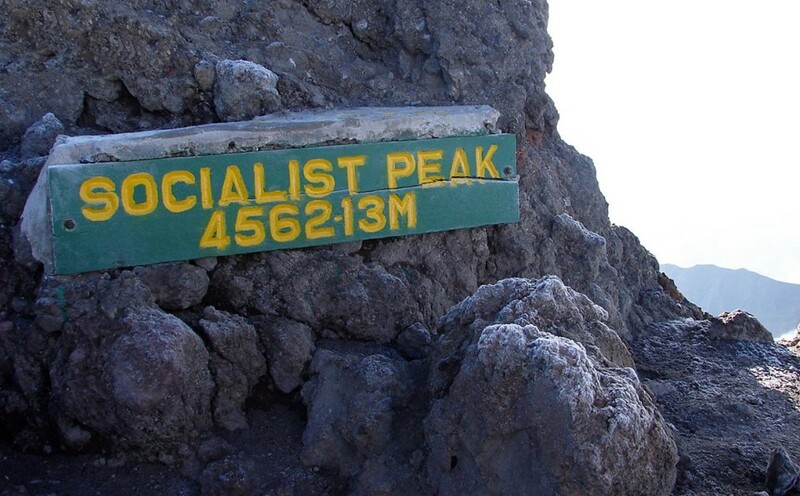 - For climbing the Mount Meru, the national park authority has a minimum age restriction of 16 years. There is no maximum age restriction and we have had customers in their 70’s who successfully reached the summit. However, we do advise persons of a more mature age to have a health check before travelling. - Because Mount Meru is not as high as Kilimanjaro, the ascent is physically less demanding but technically more challenging due to some unsecured climbing sections. This is why it is an absolute necessity that you are unafraid of heights and that you are sure-footed. You also need to be fit and healthy enough to complete the 4 to 6 hour hike each day as well as the 10-14 hour hike on the day of the summit. Is it possible to climb Mount Meru at any time of the year? - Overnight accommodation will be in basic mountain huts, which are in good condition and which you will share with other climbers. Sleeping mats are provided in the huts. - At the first camp, simple ablution facilities (running cold water, no showers) are provided. At the second camp there are no ablution facilities except for basic long drops (very simple latrines). - As the water from the springs on Mount Meru is not suitable for drinking, you will be provide with 3 litres of mineral water per day. 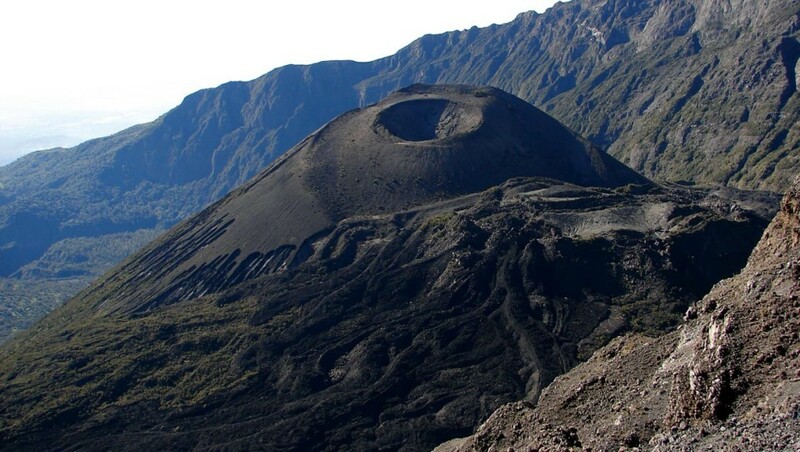 - Almost every hiker attempting Mount Meru will notice the altitude and the thinner air. Fitness fanatics are just as likely to suffer from it as are couch potatoes. Symptoms include headaches that are often accompanied by fatigue, loss of appetite and nausea. More often than not, symptoms are mild, allowing you to continue to ascend. Occasionally the symptoms are more severe and a rapid descent is required, after which your body tends to recover quite quickly. Please however always keep in mind, that severe altitude sickness can be life threatening and it may even lead to death. We do not recommend the use of medication, as it suppresses the symptoms of altitude sickness. We do however encourage you to drink enough water to replace the fluids lost from the physical activity. Two to four litres per day are recommended, as are supplementary mineral tablets (magnesium etc.) to help replace lost minerals and to prevent muscle cramps. - Unfortunately there are no state of the art mountain rescue services like the ones to be found in the European Alps for example. If you no longer have the ability to walk yourself, you will either be carried or transported on a stretcher. This is by no means a pleasant experience which is why we encourage you not to overstrain your body and to travel safe.